When you hear about “gaming” in Las Vegas, your first thought is probably Poker, Craps, or the old standby “one armed bandit” slot machines. At Insert Coins Las Vegas, however, they take a different approach. If you grew up playing Pac-Man or Street Fighter on old arcade machines, you’ll probably be drawn instantly to one of the 45 refurbished classic arcade cabinets lining the walls. If modern games are more your style, enjoy an evening of high-def Halo, Left for Dead, or other modern fare with your friends. Whatever your gaming pleasure, you’re sure to find something to keep busy at Insert Coins. All the while, you’ll be enjoying a traditional “cool” club atmosphere, with music DJ’d by special guests and video handled by renowned DJ crew ScreenWerks. The music is “geek friendly,” too, meaning lots of Daft Punk on the playlist! We’ve long since left the era when video games were “just for kids,” and Insert Coins takes full advantage of that fact. Their full bar features free gaming as long as you’re drinking, and the arcade stations have cup holders for easy drinking while you play. 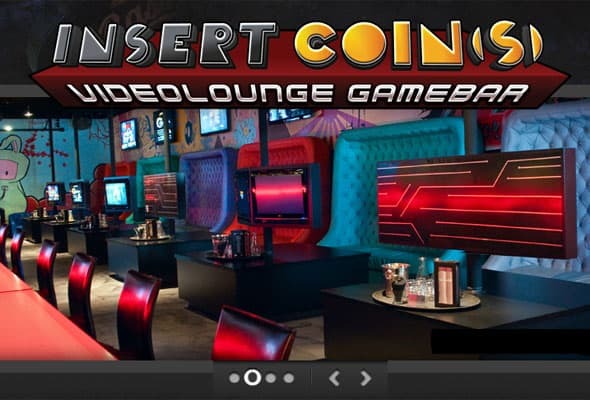 Insert Coins may now be closed, but be sure to check out the latest listing of Las Vegas club and pool events to stay up to date! "Videolounge Gamebar" brings a new meaning to "gaming" in Vegas: video games! Hours & Days Open: Open 7 days: 4pm- 4am Sun. - Thurs., until 6am on weekends. Music Style: Generally "Geek Friendly" house music; Wednesdays are 80s nights; Thursdays are hip hop; Fridays and Saturdays are just banging!